It would be very helpful if the call number would display in My Lists. As it is, you have to click on each entry in order to see it. I use the library fairly intensively and so would love to be able to print out “my list” and then go around to the stacks and pick up the books. As it is now I will need to create my own list from the list in order to record the call numbers. The My List feature is a great thing, though. Thank you for your email regarding My Lists. My Lists is one of the great new features that are now available in CLUES. 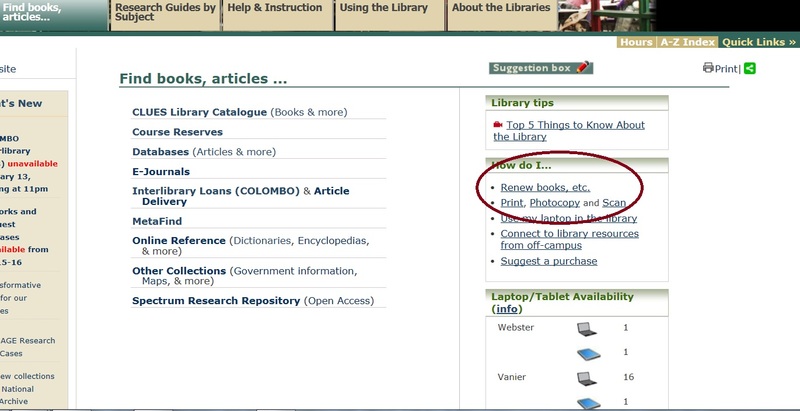 For those of you that are not familiar with them, more information is available at: http://library.concordia.ca/research/databases/cluesfeatures.php . I agree with you, it would be great if the list would display the call numbers. I’ve created a short video that shows you how I would work around that. Maybe this is what you’re already doing, but I thought I share it with you, just in case. You can see the video here. This entry was posted in CLUES, MyCLUES on August 5, 2013 by libsuggestions. Hi, I would suggest that after booking a room at the library, you show the room number in the next page. Another thing, some people book for more than one room either by mistake or carelessness. So, if you could just give a permission for each student ID to book for not more than one room it will be good idea. Thank you for your suggestion. If you do not have a chance to jot down the group study room number while you are booking it, you can retrieve it in MyCLUES. It is true that students are permitted to make up to three bookings at a time. This is so that they can plan ahead for their group work. Bookings can be cancelled in MyCLUES. More information on booking a group study room can be found here. For those of you that have never booked a group study room, here is a short video that shows you how it’s done. This entry was posted in group study rooms, MyCLUES on October 2, 2012 by libsuggestions.